Follow the Fogg museum renovation through the regular updates in our photo gallery. 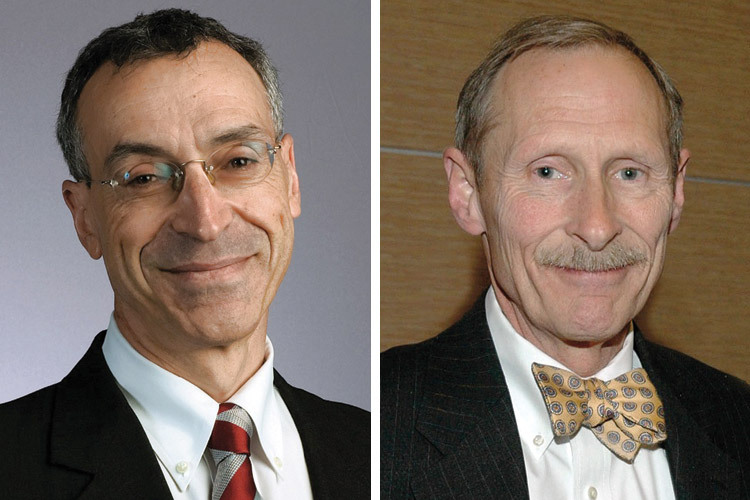 Harvard’s Board of Overseers (the University’s junior governing board) has elected Seth P. Waxman ’73 as its president and Mitchell L. Adams ’66, M.B.A. ’69, as vice chair of the executive committee for the 2010-2011 academic year. Their tenure may be especially interesting, as the senior board, the Harvard Corporation, is considering changes in governance (see page 55). Waxman, former Solicitor General of the United States, is a partner in the Washington, D.C., office of WilmerHale. Adams, executive director of the Massachusetts Technology Collaborative, previously served as Massachusetts commissioner of revenue. They succeed U.S. Court of Appeals judge Merrick B. Garland ’74, J.D. ’77, and Ann M. Fudge, M.B.A. ’77, former chair and CEO of Young & Rubicam Brands. Harvard College dean Evelynn M. Hammonds has announced the appointment of three House leaders, filling vacancies effective at the end of the academic year. Bower professor of leadership development Rakesh Khurana, of Harvard Business School (see page 30), and his wife, Stephanie Khurana, acting executive director of the Tobin Project, will be master and co-master of Cabot House. Cabot professor of the natural sciences Douglas Melton, a Howard Hughes Medical Institute investigator and co-director of the Harvard Stem Cell Institute, and his wife, Gail O’Keefe, an educational consultant, will direct Eliot House. And Smith professor of French language and literature and professor of comparative literature Christie McDonald, and her husband, Michael Rosengarten, a cardiologist, will preside at Mather House. President Barack Obama has recognized a half-dozen University alumni and affiliates with the nation’s highest honors for cultural accomplishments. Recipients of the National Humanities Medal included: Robert A. Caro, NF ’66, Pulitzer Prize-winning biographer of Lyndon Johnson and Robert Moses; Annette Gordon-Reed, J.D. ’84, another Pulitzer winner (for her biography of Sally Hemings and her family); Philippe de Montebello ’58, Ar.D. ’06, former director of the Metropolitan Museum of Art; and Theodore C. Sorensen, IOP ’03, former presidential speechwriter and adviser, and biographer. Recipients of the National Medal of the Arts included Harvard honorands Maya Lin, Ds ’83, Ar.D. ’96, designer of the Vietnam Veterans Memorial and the Civil Rights Memorial; and the opera singer Jessye Norman, D.Mus. ’88. Separately, the New-York Historical Society conferred the American History Book Prize on Gordon S. Wood, Ph.D. ’64, an emeritus professor at Brown, for Empire of Liberty: A History of the Early Republic, 1789-1815. The cost of attending Harvard College will rise to $50,724 next academic year, from $48,868 currently. The 3.8 percent increase is in the middle of the pack among peer institutions, whose announced price hikes range from 3.3 percent for Princeton and 3.5 percent for Stanford to 4.8 percent for Yale. (Each of those schools will have an undergraduate tuition, room, board, and fee bill below Harvard’s in academic year 2010-2011.) The rate of increase represents a slight acceleration compared to the 3.5 percent hikes the College put in place in each of the preceding two years. The budget for undergraduate financial aid will also rise, to $158 million--a 9 percent boost--according to the University news release. For the record, the undergraduate term bill first exceeded the $40,000 threshold in 2006. Interior demolition of the Fogg Art Museum and of Werner Otto Hall continued throughout late winter and into early spring, in preparation for heavier construction as part of a three-year, complete renovation of the Harvard Art Museum complex (see “Two Projects Proceeding,” March-April, page 48). The Faculty of Arts and Sciences has approved two programs that respond to growing interest in health-related fields. The School of Engineering and Applied Sciences will now offer an undergraduate concentration in biomedical engineering, drawing upon biology, chemistry, and engineering disciplines, and a natural evolution from recent University investments in the field (see “Engineering Bioengineering,” January-February 2009, page 37). Separately, a coordinating committee on global health has been dissolved and succeeded by an instructional standing committee on global health and health policy, thus uniting work on healthcare policy in the United States (already a popular secondary field of study among College students) and in other nations. The result will be an enlarged secondary field of study embracing health issues around the globe. Envisioning research. Harvard Medical School has established a new executive deanship for research, and appointed William W. Chin to the position. He had previously served as senior vice president for discovery research and clinical investigation at Eli Lilly and Company, and for 25 years as a faculty member at the school. Chin will elaborate a research strategy aimed at interdisciplinary work crossing boundaries among the school’s departments and its affiliated hospitals. Public-service law. Harvard Law School has created a public-service venture fund, able to award $1 million in grants annually to help graduating students pursue careers in nonprofit organizations or government agencies. It succeeds, in part, the now-suspended program that waived third-year tuition for students who made five-year commitments to public service. Undergraduate opportunities. The College has combined its Office of Career Services (for job counseling and searches) with both its new Office of Undergraduate Research Initiatives (for scientific and other research placements) and the Office of International Programs (for study-abroad, internships, and public- service options). Robin Mount, who had been interim director of OCS, has been appointed director of the newly named Office of Career, Research, and International Opportunities. ROTC Rumblings. As policymakers in Washington discuss ending the military’s “don’t ask, don’t tell” policy concerning service by homosexuals (Harvard Law School dean Martha Minow and peers at Berkeley, NYU, Stanford, and Yale in mid March urged congressional leaders to end the ban), Stanford’s Faculty Senate appointed a committee to study that institution’s response, including the possible benefits of re-establishing a Reserve Officers’ Training Corps program on campus. ROTC programs at Stanford were phased out in the early 1970s, after the senate ended credit for courses in 1970; current students go to ROTC programs on other institutions’ campuses, as Harvard cadets travel downriver to MIT today. Miscellany. Charles Clements, who has been president of the Unitarian Universalist Service Committee and of Physicians for Human Rights, has been named executive director of the Harvard Kennedy School’s Carr Center for Human Rights Policy….Loeb University Professor Laurence Tribe, the constitutional-law scholar, has been appointed senior counselor for access to justice at the U.S. Department of Justice, where he will lead an initiative to improve access to civil and criminal legal services.…Jody Freeman, who had served as White House counselor for energy and climate change since early 2009, returned to the Law School in March and was appointed to a chair named for former Solicitor General and Watergate special prosecutor Archibald Cox Jr. ’34, LL.B. ’37, LL.D. ’75, former Loeb University Professor. She will resume direction of the school’s environmental law program.…Harvard has launched a dedicated iTunes site for University-generated content; log in at http://iTunes.harvard.edu.…Harvard Art Museum has appointed Mary Schneider Enriquez as Houghton Associate Curator of Modern and Contemporary Art. She has been Latin American art adviser to the museum since 2002 and is completing her Ph.D. in the department of history of art and architecture.…The Harvard Project on American Indian Economic Development and a companion Native Nations Institute at the University of Arizona were honored with public sector leadership awards by the National Congress of American Indians, the organization of American Indian nation governments.